Bainimarama makes these statements while he deliberately looks the other way and ignores the brutality by his military goons who are intimidating and beating up people around the country. Bainimarama also gave orders to torture over 60 CRW soldiers and civilians to near death. Some soldiers died. 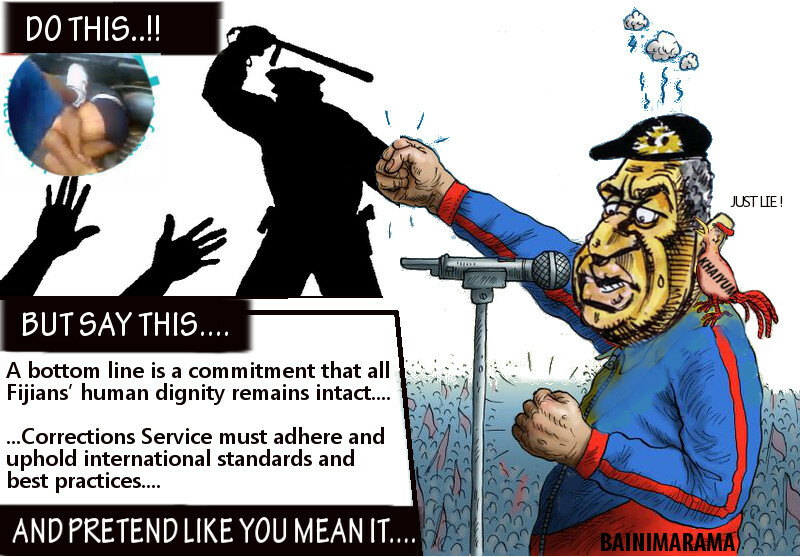 And Bainimarama again stated that he would stand by the police officers or anyone else who would be named as individuals shown in a video beating up two handcuffed men. This is a prime example of person (Bainimarama) who has perfected lying to the people of Fiji. Deliberately lying to fool the less educated people of Fiji and to impress those unscrupulous people who benefit from and support Bainimarama's corruption. the illegal members of cabinet.